Background: Neonatal jaundice (NNJ) is one of the most frequent reasons newborn babies in low- to middle-income countries visit the hospital during the neonatal period. If not promptly managed, it could lead to serious neurological sequela and mortality. The level and type of bilirubin in serum are an important determinant of the management option in NNJ. Unfortunately, this simple but fundamental investigation is not readily available in many hospitals in low- to middle-income countries, and where available, needs to be done serially, an expenditure most clients cannot afford. Methodology: This study enrolled 83 newborns admitted and managed for NNJ at the Enugu State University Teaching Hospital during an 18-month period. We report correlation between total serum bilirubin (TSB) and selected newborn clinical and laboratory parameters. Results: A total of 83 newborns were admitted for NNJ during the study. The mean TSB (mTSB) was 307 ± 145.2 μmol/L. Preterm infants (T = 0.462, P = 0.500), neonates with birth weight <2.5 kg (T = 0.219, P = 0.804), female neonate (T = 0.314, P = 0.578), and those that presented with skin level at the lower body region (T = 28.52, P = 0.001) had a higher mTSB at presentation to the special care baby unit. Similarly, mTSB at presentation was higher in neonates with PCV <40% (T = 0.005, P = 0.942), negative malaria parasite film (T = 0.01, P = 0.933), and those that were Glucose-6-Phosphate dehydrogenase deficient (T = 1.59, P = 0.221). Only skin level of jaundice at presentation was significantly correlated to the TSB (R = 0.818 P = 0.001) while gestational age (R = 0.096, P = 0.500), age at presentation (R = 0.197, P = 0.157), and birth weight (R = −0.107, P = 0.459) were not. Linear regression analysis showed that for every regional rise in skin level of jaundice (X), the TSB (Y) in μmol/L increases by a factor of 89.74 expressed in a regression equation as, Y = −10.66 + 89.74 X. Conclusions: The skin level of jaundice can be used as a rough guide in the estimation of total bilirubin in newborns with jaundice. This is especially useful in resource-limited setting where facilities for testing bilirubin level are lacking. Neonatal jaundice (NNJ) is one of the nine danger signs of neonatal illness recognized by the World Health Organization. It is a neonatal emergency and should be reviewed as urgently as possible to determine the causative factors, clinical course, and the best treatment option to avert the associated neurological sequel. Several treatment options for NNJ exist. A key determinant of the treatment option(s) employed is to a large extent dependent on the serum bilirubin level. For instance, in our center, EBT is recommended at total serum bilirubin (TSB) level >20 mg/dl and >15 mg/dl for the term and preterm newborns, respectively, while phototherapy is recommended at two-thirds of the respective TSB level for EBT. One of the setbacks in the use of SB level is lack of readily available laboratory facilities for immediate serum bilirubin estimation, especially in a resource-limited setting like ours. Furthermore, a previous study in our setting has documented that the cost of managing a newborn with jaundice was significantly increased by the cost of serial TSB tests. In the authors experience, during management of newborns with jaundice, most parents were unwilling or unable to pay for the serial TSB tests as recommended. Hence, most experienced physicians sometimes resort to clinical findings in deciding the best treatment option(s). There is a need for a convenient, cost-effective clinical tool that will correlate positively with TSB. Such tool will enhance immediate and effective clinical decision when managing jaundice in a resource-limited setting. Kramer correlated the skin zones of jaundice in white children with the serum bilirubin level and discovered that as serum bilirubin level rises, jaundice progresses cephalocaudally. However, this finding was in developed setting where currently its use may not be of essence following the availability of more sophisticated effective point-of-care serum bilirubin estimation facilities. There is need to validate this clinical tool among blacks in resource-limited settings where there is obvious need for such a cost-effective tool. The authors therefore, attempted to correlate TSB with some clinical and laboratory parameters in babies admitted for NNJ at the Enugu State University Teaching Hospital (ESUTH). This research is the second part of an evaluation survey done on newborns admitted for NNJ in the special care baby unit (SCBU) of ESUTH. It is an 18-month study conducted between April 2015 and October 2016. The SCBU is equipped with facilities and manpower for care of sick newborns within the first 28 days of life. It is located within the ESUTH which is a tertiary healthcare institution situated in the capital city of Enugu State, southeast Nigeria. It serves as a referral hospital for other healthcare facilities within the state and its environs. This is a descriptive and analytical study of newborns admitted for jaundice at the SCBU of ESUTH. On presentation, mothers and/or caregivers of the admitted newborns are informed of the content of this research. They are assured that participation is voluntary and they are at liberty to exit the research at any point without consequences to themselves or their babies. They were also assured that data collected was strictly confidential and will only be utilized for research purpose only. No form of inducement or incentive was offered to influence their decision to participate. Babies of mothers who gave consent were consecutively enrolled at presentation. Demographic characteristics of interest such as gestational age at birth, place of birth, birth weight, gender, time of notice of jaundice, and time of presentation to hospital were documented on admission into the SCBU. In every newborn enrolled, the skin level of jaundice at presentation was carefully and cautiously assessed under daylight or whitelight independently by two pediatric specialists not involved in the study. In a handful of cases where there is difference in the documented skin level of icterus, a third specialist was invited as the decider. 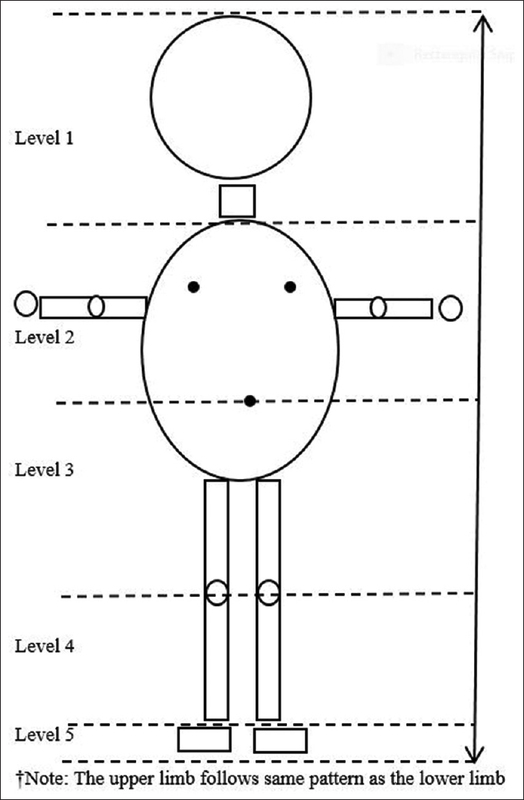 Skin levels of jaundice were documented and stratified as follows: Level 1, for yellowish skin discoloration limited to the head-and-neck region; Level 2, for jaundice appearing anywhere between the upper chest to the umbilical line; Level 3, for discoloration visible below the umbilical line down to the knee joint; Level 4, for skin discoloration noticeable in the leg region between the knee and ankle joint and level 5 for jaundice appearing on the palm of hand, the sole of the foot or that is generalized [Figure 1]. Furthermore, as part of the management protocol, blood samples were collected at presentation from all admitted newborn for serum bilirubin estimations, glucose-6-phosphate dehydrogenase (G6PD) status, blood film for malaria parasite, and neutrophilic band forms/toxic granulations. The final outcome of the babies were also noted as alive for babies discharged home or dead for those who died while still on admission. The anthropometric data of enrolled newborns, clinical features, and laboratory results were collected in the relevant sections of the questionnaire and later transferred into a Microsoft Excel sheet. Mean total bilirubin of enrolled newborns in various subcategories was calculated and compared using Student's t-test. 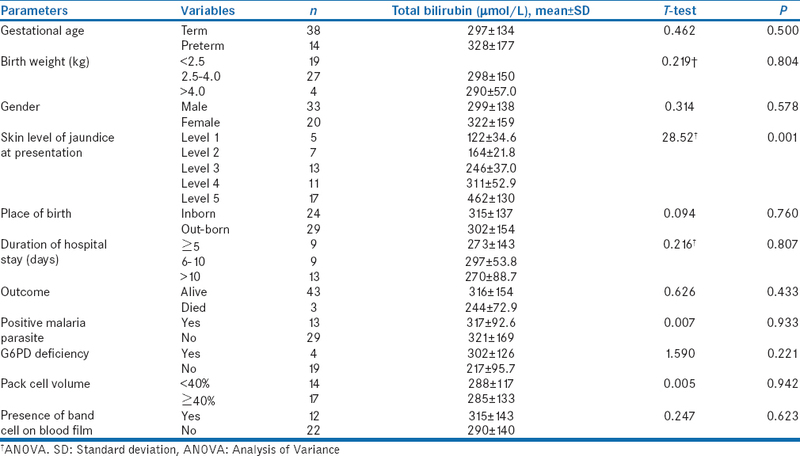 Correlation between bilirubin level and selected newborns and laboratory parameters was done using the Pearson coefficient. Partial correlation analysis was used to control for newborn variable of interest. Enrollees with significant missing information were excluded from the data analysis. Data was analyzed using IBM® SPSS version 20 (SPSS Inc., Chicago, IL, USA), and statistical significance was set at <0.05. Of the 83 newborns enrolled for this study, 65% were term deliveries, whereas 48% had birth weight <2.5 kg and 6% were over 4 kg at birth. The remaining newborns had birth weight in the normal range (2.5–4.0 kg). Male-to-female ratio was roughly 3:2. Thirteen percent of the mothers said that they noticed jaundice in their newborn within the 1st day of life, 81% between 2 and 7 days of life, and 6% after 1 week of life. Eight (10%) mothers presented to the hospital on the same day jaundice were noticed, majority (71%) between 2 and 7 days and 19% presented after 7 days of life. Approximately 41% and 59% of neonates admitted for jaundice were born within and outside the study setting. The skin level of jaundice at presentation was noted at level 1, 2 and 3 in 9%, 13% and 25% of cases respectively while 21% and 32% of newborn were admitted with yellowish skin discolouration at level 4 and 5. A case fatality of 6% was documented among surveyed newborns [Table 1]. The mean TSB (mTSB)was 307.7 ± 145.2 μmol/L in surveyed neonates. The mean value for unconjugated and conjugated bilirubin was 257.5 ± 127.6 μmol/L and 48.7 ± 83.7 μmol/L, respectively. [Table 2] shows the mTSB stratified by newborn parameters. Preterm infants had a higher mean bilirubin compared to term neonates (297 ± 134 vs. 328 ± 177 μmol/L; T = 0.462, P = 0.500). Similarly, neonates with birth weight < 2.5 kg had a higher mean total bilirubin level (325 ± 164 μmol/L) compared to those with normal (298 ± 150 μmol/L) and large birth weights (290 ± 57.0 μmol/L) (T = 0.219, P = 0.804). Female newborns also presented with a higher mean total bilirubin than male (322 ± 159 vs. 299 ± 138, T = 0.314, P = 0.578). None these, however, attained statistical significance. Newborns that presented with jaundice at more caudal location had significantly higher mean level of total bilirubin compared to those that presented at more cephalic region, i.e., 122 ± 34.6 μmol/L for Level 1 presentation, 164 ± 21.8 μmol/L for Level 2 presentation, 246 ± 37.0 μmol/L for Level 3 presentation, 311 ± 52.9 μmol/L for Level 4, and 462 ± 130 μmol/L for Level 5 presentation (T = 28.52, P = 0.001). Total bilirubin in babies with presentation PCV < 40% versus ≥40% was 288 ± 117 μmol/L versus 285 ± 133 μmol/L (T = 0.005, P = 0.942). Finally, newborn that had negative malaria parasite film (321 ± 169) and those that were G6PD deficient (302 ± 126 μmol/L) also had a higher mTSB compared to those who are malaria parasite positive (317 ± 92.6 μmol/L, T = 0.01, P = 0.933) and those not deficient (217 ± 95.7 μmol/L, T = 1.59, P = 0.221). [Figure 2] shows the correlation between TSB and selected parameters in newborns surveyed. 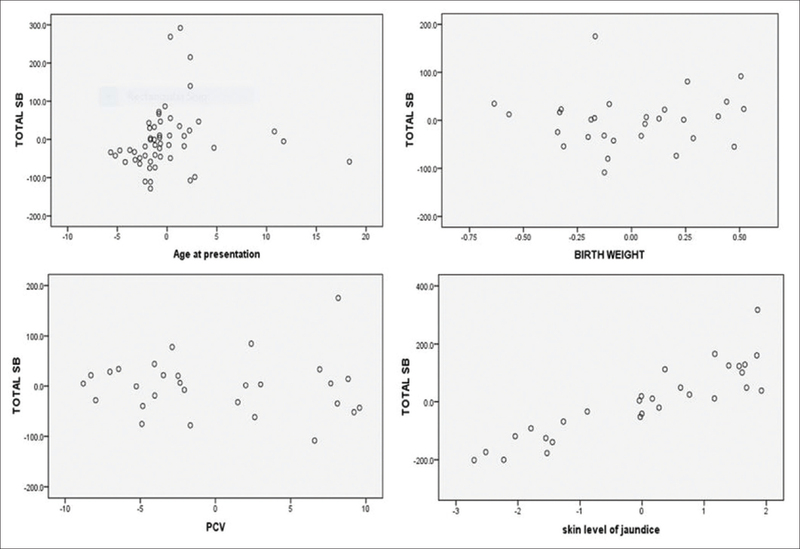 Gestational age (R = 0.096, P = 0.500), age at presentation to the hospital (R = 0.096, P = 0.157) and birth weight (R = −0.107, P = 0.459) were not significantly correlated with TSB. However, the level of skin discoloration on presentation was significantly correlated with the TSB on admission (R = 0.818, P =0.001). After controlling for birth weight and gestational age at birth using partial correlation analysis, there was respectively, a slight increase (R = 0.821, P = 0.001) and decrease (R = 0.813, P = 0.001) of the correlation co-efficient between TSB and level of skin discoloration while gender of newborn had no effect (R = 0.818, P = 0.001) on the relationship. Linear regression analysis showed that for every level of caudal progression of jaundice, the TSB (in μmol/L) increases by a factor of 89.74 giving a regression equation represented as Y = −10.66 + 89.74 X, where Y is the estimated TSB in μmol/L and X is the observed skin level of jaundice at presentation to the hospital [Table 3]. Finally, our study showed that for every regional descent in skin level of jaundice, the TSB increases by a roughly a factor of 90 μmol/L. No other similar studies were found for comparison. This may have practical application in the field where the facility for serum bilirubin estimation is lacking because of the simplicity of calculation involved. Kramer in 1969 also noted a progressive increase in serum bilirubin with craniocaudal development of skin discoloration. He estimated that serum bilirubin was approximately 100 μmol/L for skin discoloration at zone 1 (head and neck), 150 μmol/L at zone 2 (chest and upper abdomen), 200 μmol/L at zone 3 (lower abdomen and thigh), 250 μmol/L at zone 4 (between the knee and ankle joint), and >250 μmol/L at zone 5 (hand and/or foot). 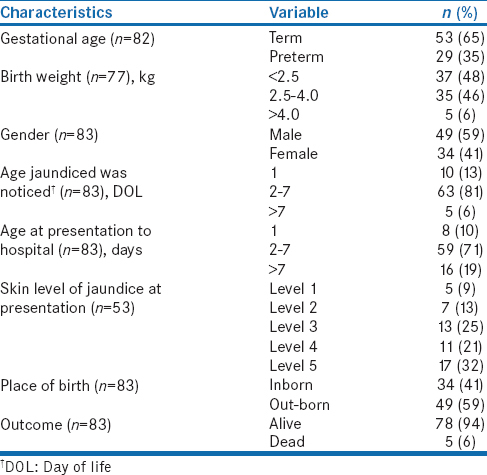 We conclude that the skin level of jaundice can be used as a rough guide in the estimation of total bilirubin in newborns with jaundice, especially in resource-limited setting where facilities for testing bilirubin level are lacking and/or not serially affordable by parents of newborn admitted for neonatal jaundice. World Health Organization, UNICEF. Caring for the Newborn at Home; a Training Course for Community Health Workers; Community Health Workers Manual. Geneva: World Health Organization; 2012. Ibe BC. Neonatal Jaundice. In: Azubuike JC, Nkanginieme KEO (editors). Paediatrics and child health in a tropical region. 2nd ed. Port Harcourt: University of Port Harcourt press; 2007. p. 204. Ekwochi U, Osuorah DC, Ndu IK, Ezenwosu OU, Amadi OF, Nwokoye IC, et al. Out-of-pocket cost of managing sick newborns in Enugu, Southeast Nigeria. Clinicoecon Outcomes Res 2014;6:29-35. Kramer LI. Advancement of dermal icterus in the jaundiced newborn. Am J Dis Child 1969;118:454-8. Ebbesen F. The relationship between the cephalo-pedal progress of clinical icterus and the serum bilirubin concentration in newborn infants without blood type sensitization. Acta Obstet Gynecol Scand 1975;54:329-32. Thong YH, Rahman AA, Choo M, Tor ST, Robinson MJ. Dermal icteric zones and serum bilirubin levels in neonatal jaundice. Singapore Med J 1976;17:184-5. Rimawi H, Abu-Salah O. Clinical ability to accurately identify signifi cant neonatal jaundice. Sudan Med J 2011;47:147-152. Imani Mahmood HT, Taghi M, Mehdi M. Transcutaneous bilirubinometery compared with serum level of bilirubin in icteric neonates in Zahedan. J Med Sci 2005;5:239-42. Rai S, Kaur S, Hamid A, Shobha P. Association of dermal icterus with serum bilirubin in newborns weighing <2000 grams. Int J Sci Study 2015;3:65-9. Knudsen A, Ebbesen F. Cephalocaudal progression of jaundice in newborns admitted to neonatal Intensive Care Units. Biol Neonate 1997;71:357-61. Szabo P, Wolf M, Bucher HU, Haensse D, Fauchère JC, Arlettaz R, et al. Assessment of jaundice in preterm neonates: Comparison between clinical assessment, two transcutaneous bilirubinometers and serum bilirubin values. Acta Paediatr 2004;93:1491-5. Ullah S, Rahman K, Hedayati M. Hyperbilirubinemia in neonates: Types, causes, clinical examinations, preventive measures and treatments: A narrative review article. Iran J Public Health 2016;45:558-68. Olusanya BO, Ogunlesi TA, Kumar P, Boo NY, Iskander IF, de Almeida MF, et al. Management of late-preterm and term infants with hyperbilirubinaemia in resource-constrained settings. BMC Pediatr 2015;15:39.